Delta boosts Europe service from JFK, ATL. On June 16, Delta will kick off new year-round daily service between New York JFK and Zurich, using a 767-300ER; the airline also recently started seasonal daily A330-300 flights from JFK to Rome. From its Atlanta hub, Delta said that this coming winter it plans to increase European frequencies as well, offering four flights a day to both Paris and Amsterdam in conjunction with joint venture partners Air France and KLM. Southwest expands mobile boarding passes; relaunches credit card; will end AirTran program. Southwest Airlines, which was slow to start out with mobile boarding pass technology, is catching up. Previously available only in at Dallas-Love, Houston-Hobby and Austin airports, the airline’s mobile passes are now offered to passengers flying out of Baltimore/Washington, Phoenix, Orlando, Denver and Chicago Midway. Meanwhile, Southwest has started to notify members of subsidiary AirTran’s frequent flyer program that the latter’s A+ Rewards plan will be fully integrated into Southwest’s Rapid Rewards program in November. The Southwest Airlines Rapid Rewards Premier Credit Card is now offering a 25,000 points sign up bonus (enough for a roundtrip flight) after spending just $1,000 in first three months, plus a 6,000 point bump every year on your cardmember anniversary. Survey: Alaska’s Mileage Plan is tops in member satisfaction. Members of Alaska Airlines’ Mileage Plan frequent flyer program are more satisfied than those in other carrier loyalty programs, according to the results of a new survey by J.D. Power and Associates. Southwest’s Rapid Rewards ranked second, followed by JetBlue’s TrueBlue. J.D. Power doesn’t assign specific scores to United, Delta and American, but rather describes their loyalty member satisfaction levels as “about average.” It looks like United’s Mileage Plus program did a bit better than American AAdvantage and Delta SkyMiles, which tied. US Airways Dividend Miles program was at the bottom. Virgin America was not included in the survey, but there’s no explanation as to why not. 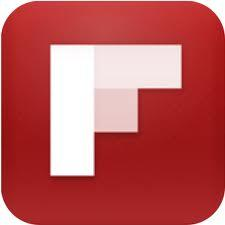 Frontier adds a big presence at Washington Dulles. Denver-based Frontier Airlines, now an ultra-low-cost carrier (i.e., it recently started charging a fee for overhead bin carry-on bags), will invade new turf this summer when it starts flying out of Washington Dulles to 14 destinations. On August 19, it will begin service from IAD to Atlanta (6x per week), Charlotte, Orlando, Minneapolis/St. Paul, and Tampa. On September 8, it will add flights to Chicago O’Hare, Cincinnati, Detroit, Fort Lauderdale, Las Vegas, Memphis, Fort Myers, St. Louis and Jacksonville/St. Augustine. American unveils new routes for the fall. American Airlines will add eight new routes to its domestic network in the months ahead, operated as American Eagle or US Airways Express service. Grand Rapids-Charlotte and Grand Rapids-Philadelphia flights start September 3. Routes kicking off October 2 include Charlotte-Evansville, Ind. ; Charlotte-Ft. Wayne, Ind. ; Chicago-Bismarck, N.D.; Dallas/Ft Worth-Bismarck; Philadelphia-Ft. Wayne and Phoenix-Cleveland. United adds tarmac transfers at LAX. 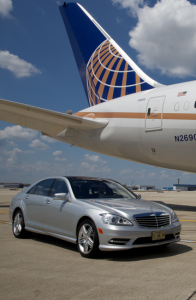 Selected United Global Services and United Global First customers at Los Angeles International Airport can now make flight connections in style via a chauffeur-driven Mercedes across the tarmac. This new trend in premium pampering was started by Delta (with Porsches) and then picked up by United, which already offers it at Chicago-ORD, Houston-IAH, Newark-EWR and SFO. Atlanta & Charlotte airports get new automated passport kiosks. Both Atlanta Hartsfield-Jackson and Charlotte Douglas International Airport have deployed new automated passport control kiosks that should help to speed up the entry process for U.S. citizens who are not members of Customs and Border Protection’s Global Entry trusted traveler program. The self-service touch-screen kiosks can reduce line time by 20 to 50 percent. Charlotte also got a new application center for travelers who want to join TSA’s PreCheck program. New American Eagle gates debut at DFW. Dallas/Ft. Worth International Airport this month opened a new 10-gate concourse extension of Terminal B to handle American Eagle regional jet flights. The 20,000-square-foot extension has charging stations, free Wi-Fi and “a comfort zone seating area,” and its entrance is adjacent to a Skylink station. Business properties open in London, Washington. It opened several months behind its original schedule, but officials of Shangri-La Hotels this month finally cut the ribbon on the group’s first London property, with 202 rooms occupying floors 34 through 52 of The Shard, an 87-story pointed tower near London Bridge (south side of the Thames) that claims to be the tallest building in western Europe. 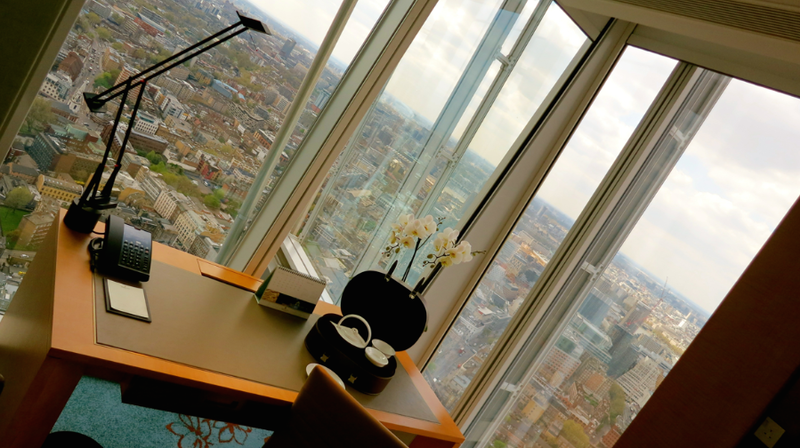 Shangri-La Hotel At The Shard has guestrooms with floor-to-ceiling windows and nightly rates starting at $759. (TravelSkills editor Chris McGinnis was there last month for a sneak peek and snagged the photo above.) Meanwhile, Marriott’s newly opened Marriott Marquis Washington D.C., linked to the Walter E. Washington Convention Center, is the largest in the nation’s capital with 1,175 rooms. >Potentially delay-inducing runway construction got off to a good start last week at SFO– on Sunday, delays did not exceed one hour for most of the day. >Virgin America last week won two gates at Dallas Love Field. >Members of Marriott Rewards can now earn up to 2,000 points a month for their social media activity. >Booked your vacation flights yet? Don’t wait: The volume of U.S. air travel this summer is expected to be the highest in six years.